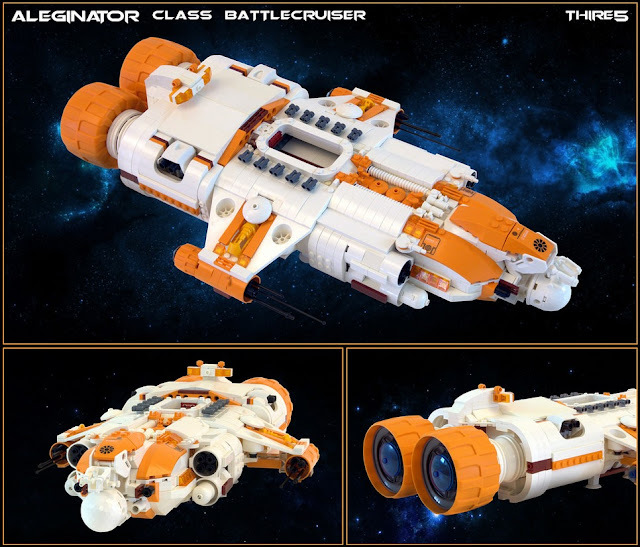 This great battlecruiser MOC was recently shared by LEGO fan and flick.com user Martin Latta a.k.a. thire5, who is known for his great Star Wars and sci-fi creations and was blogged here before with his great Battle of Hoth diorama. Although it is not common use, white-orange color combination looks beautiful on this ship. I always like micro-scale spaceships with nice hull-shape and details and this one is a great example. The hangar entrance on top of the cruiser is my favourite part on this MOC.